On a hot June Summer I traveled to Franklin, Tennessee. I was on a mission. Books. 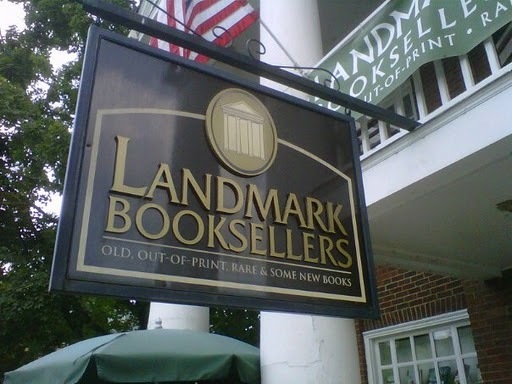 Landmark Booksellers to be specific. A while back I started stalking following them on Facebook. Last year I had the privilege of visiting historical Franklin, Tennessee. More specifically, Landmark Booksellers. What a great little treat. I met Joel and Carol Tomlin, owners of Landmark Booksellers. I had been communicating with Landmark Booksellers via Facebook for a few weeks and when they had a special on the 75th anniversary edition of Gone With The Wind I knew I had to go up and see them. The drive was only 1.5 hours, straight up I-65. That is one of the great things about living in Huntsville, Alabama – it’s not a long drive to visit other places, in any direction. Landmark Booksellers specialize in old, out-of-print, rare, and some new books. As Joel and Carol say, “A book lover’s paradise!” They have several first editions and a lot of signed books as well. As soon as I walked into the store, Joel greeted me warmly and knew right away who I was. I felt like a celebrity. He was busy entertaining another guest so I showed myself around for a few minutes, taking photos and being enamored with every single author and book. The place seemed magical to me because whenever a book title or author came into my mind all I had to do was scan the shelf and there it appeared right before my eyes. I was a little overwhelmed and wanted to take it all in at once. I had to force myself to slow down and take my time. When Joel and Carol caught a break they sat down with me and we talked about the future of books and bookstores. He gave me a brief background of how they got started in the book business. I would go ahead and tell you but I’d rather you go visit them and have your own engaging conversation with the Tomlins. It is an experience you do not want to pass up. I even got the special treatment and was shown to the additional building they purchased behind the store and where hundreds of other books were stored and some still in boxes. I can’t imagine what types of books have yet to be discovered back there. I almost asked Joel if I could come up on the weekends to help inventory all those fabulous works of art. To be in the presence of all those stories waiting to be rediscovered was a powerful experience for me. There will be several trips planned for me to go back to Landmark Booksellers. Joel suggested some great books for me, which of course I carried home with me. On their website they state that they will help you start a building your own personal library and that is exactly what Joel started for me on the day I visited. Not only did I walk away with the reason I went in the first place, Gone With The Wind but I also went home with My Reading Life by Pat Conroy, Twilight by William Gay, On Writing by Eudora Welty, and then Joel graciously bestowed upon me a gift; The Case for Books by Robert Darnton. There was so much more I wanted to bring home with me but this is another reason to head back to Franklin, Tennessee to visit Joel and Carol Tomlin at Landmark Bookseller. It will be a relationship to nurture over the years with knowledge and a shared respect for the printed word. Thank you Joel and Carol Tomlin for welcoming me into your lovely paradise of books and treating me like family.